Lees Corner PTA – a GREAT place to grow! Have ideas or suggestions? Please let us know here, or by email leescornerpta@gmail.com. 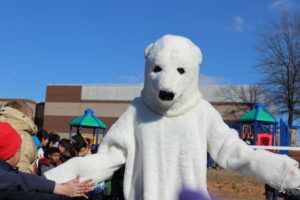 Blizzard the bear says, "Don't delay, join the PTA!" Promote the welfare of children and youth in home, school and community. Encourage parent and public involvement in the public schools. Speak on behalf of the children and youth in schools, in the community, and before governmental bodies and other organizations that make decisions affecting children. Foster an open relationship between educators, parents and the general public that will secure for all children and youth the highest advantages in physical, mental, social, and spiritual education. We meet the second Monday of the month at 7pm in the school library. Revised bylaws were approved by the Virginia PTA in 2017. For a copy, please click here: 2017 Bylaws - Lees Corner Elementary. By joining or renewing your annual membership to the PTA, you are enriching the lives of every child who attends Lees Corner Elementary School! Your annual dues allows the PTA to fund assemblies and field trips that allow students to see things and go to places they might not otherwise get to visit. By attending our family fun nights and other fundraising activities, you remind children that their school is an important part of the community. By volunteering your spare time, you help the PTA, teachers and other school officials make Lees Corner a great place to learn. Joining PTA does not mandate that you do anything. We are grateful for your continued financial support and thank you for the lifetime of memories you are creating for Lees Corner students today.